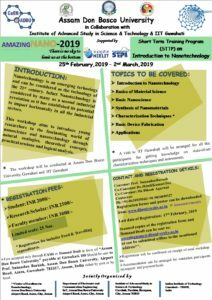 Assam Don Bosco University in collaboration with IASST, IIT Guwahati is organizing a Short Term Training Programme on ‘Introduction to Nanotechnology’. The details are given below, with an introduction to this programme. When Sir Richard Feynman suggested the possibilities of manipulating atoms to make novel materials in his speech in 1959, very few people were convinced. With rapid advancements in technological tools, over the last few decades, the dreams of the famous scientist became a reality. Nanotechnology is an emerging technology and can be considered as the technology of the 21st century. In fact Nanotechnology is considered by many as a second industrial revolution as it has managed to create an impact horizontally in all the industrial sectors. Novel properties of nanomaterials which are quite different from their bulk counter parts can be applied for developing low cost, environmental friendly, efficient devices for various applications. After successful completion of “imagineNANO-2014” and demand of the new researcher in the field of nanotechnology we propose the similar workshop again as “imagineNANO-2015”. This workshop aims to introduce young researchers to the fascinating world of nanoscience and nanotechnology through natural analogies, theoretical concepts, practical sessions and logical analysis. The workshop targets the participants who are enthusiastic about working with nanomaterials either being a student, research scholar or faculty member. The workshop will be conducted at Assam Don Bosco University, Azara Campus and Tezpur University, Tezpur.